We are a Led Power Flares manufacturer supplier in China offering Single Pack & 6 Packs Rehcargebale Led Power Flares and Led Road Flares. Identify road hazards, signal for help, mark detours,underwater scuba or repair applications. Ideal for emergency responders. roadsafety identification by emergency responders and personal vehicle operators.May also be used on construction sites, for aviation guiding and taxiing,event management, in marine applications for boater emergency safety or scuba. Led Power Flares will bring you safe and secure and can be used as follows. LED Power Flares is an ideal signal light to identify Road Hazards, Mark Detours, Underwater Repair Applications And More and A great item to keep in your vehicle at all times that can be used to signal for help or identify road hazards and used for traffic control, firefighters, EMTs, rescue services, first responders, members of emergency response teams and the general public and used in cars, trucks, boats, RVs, semi-trucks, construction zones, and emergency response vehicles. Nowadays, most of the people go for non-toxic light sources to provide protection to the entire environment from all sorts of adverse effects. Positively, LED lighting systems do not produce any smoke, flame or harmful bi-product. 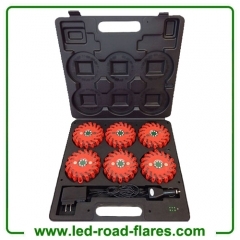 Even LED power flares not only act as ideal replacements for different types of incendiary flares in the market but also serve as relatively safe and secure to perform almost every type of application. LED flares are available to people with both non-rechargeable and rechargeable forms and in varieties of color combinations. These are available as flameless and containing shielding with the help of waterproof and crushproof enclosures, while ultra bright LED lights are responsible for illumination of such flares. Enclosure of an LED light consists of top quality plastics, which are resistant to crush and unbreakable even during difficult times. Therefore, almost every crucial department opts to use it. Even fire services, traffic officers and other important emergency levels of service providers choose to use LED road flares or simple flares to take important steps within time and avoid all sorts of serious issues. Common people also go for using flares comprise of light emitting diodes as indicators and thereby, able to call out for help in case of road related hazards and accidents. Based on this, people should consider it as one of the essential instruments for avoiding any type of turmoil. People may use it in different types of vehicles and the flare component works as fastest possible medium to transmit messages in symbolic manner. At times, when you do not require flares, you may go for changing them and extend single charging time for many hours of consistent application. LED power flares are available with different colors of flashlights and incorporate magnetic bases, which stick to any vehicle’s body. Even it comes with on or off switch that helps users to turn on or off the light based on requirements and thereby, saves on battery charge to use while driving vehicles during emergencies. LED lights are of soothing light systems and they never create any kind of harsh effect on environment. These lighting systems provide protection from all sorts of damages. Other than this, lighting systems designed by using LEDs are of cost effective ones and guarantee for their applications for long time.